With 2014 winding down, I’d like to present to my readers the ten most popular articles of the year on my website. I’m also going to list 40 additional articles that are worth reading from 2014 (this way you have the top 50 articles). This has been a kickass year in terms of content. I’d like to offer a big thanks to all of my guest contributors and interviewees, and a huge thanks to all of the readers and fans who share my articles, send me before/after pics, and tag me on social media. Without you, the blog definitely wouldn’t be what it is today. I don’t know how I’ll top this in 2015 but of course I will try my best. THIS was the most popular article of 2014. I’m happy that this one took the top spot, as it was very personal to me. Ain’t no stoppin’ the hip thrust! I have a big problem with meatheads and powerlifters bullying and disrespecting other lifters, especially when they’re on steroids and the lifters they’re poking fun of are natural. THIS article addresses this concern. With all of the conflicting information out there, beginning lifters have their work cut out for them. I wrote THIS article to help out the beginners and clear up some confusion. Squat until your heart is content. Just please add in other exercises! Click HERE to read my thoughts on the far from optimal “just squat” mentality. Excuses are a dime a dozen. Click HERE to learn why all fitness excuses are a bunch of rubbish. HERE is Casey Bergh’s amazing transformation. She’s a total badass, and y’all loved her story. Click HERE to find out why I’m not a fan of bulking and cutting, and why I feel that slow and steady is the more appropriate course of action in fitness. THIS article was a big hit. Are you one of these types of trainers? I hope not. Sure, the article was fun to write, but taking the pictures was even more enjoyable. Yoga and Pilates are good forms of training. But if you want long and lean muscles, lift weights. Click HERE to find out why lifting weights is better suited for actually lengthening muscle and leaning out the body than Yoga or Pilates. 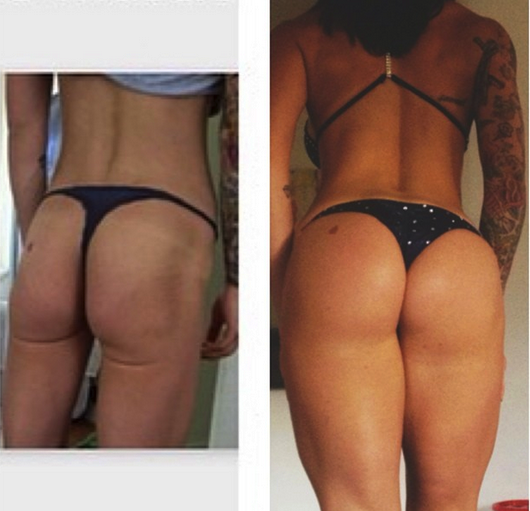 HERE are some great glute transformation stories along with their training strategies, including Sasha Ann’s below. The articles below didn’t make the top ten spot, but many of these will whet your appetite. What’s the Difference Between a Romanian Deadlift, American Deadlift, Stiff Legged Deadlift, and Straight Leg Deadlift? What Are the Best Glute Exercises? Are the Hamstrings Really Primarily Fast-Twitch? What’s the Best Single Leg Exercise? The post Top 10 BretContreras.Com Articles in 2014 appeared first on Bret Contreras. The post Squat vs. Hip Thrust vs. Deadlift Study Predictions appeared first on Bret Contreras. The post This is 40 appeared first on Bret Contreras. The post Glute Lab Seminar #2 appeared first on Bret Contreras.